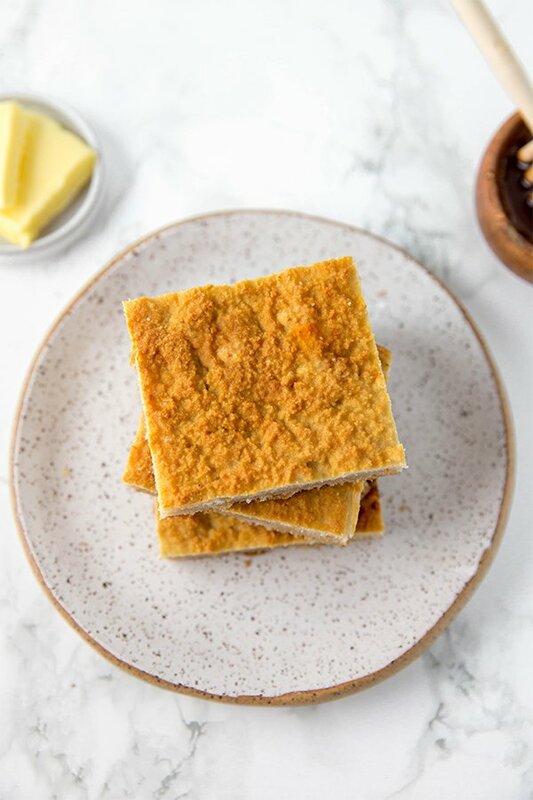 This grain-free cornbread is made without any actual corn! It’s paleo, AIP, and tastes shockingly similar to the real thing. I love cornbread. I mean… not real cornbread. I loved the jiffy cornbread mix! You know… the one in the little blue box? Yep. That was my absolute favorite! I would eat it with a squeeze bottle of grape jelly and margarine any time of year! But of course, I always asked my mom to make it for Thanksgiving too! Cornbread is one of those things I just decided I would never be able to have again. I cannot tolerate corn, so how would I eat cornbread? 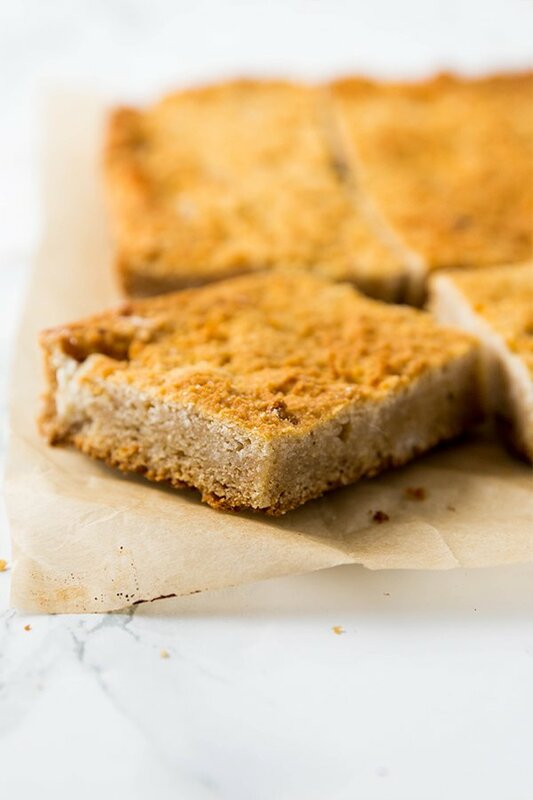 This grain-free paleo cornbread is the answer to my prayers! It’s made with zero corn and is also AIP compliant. 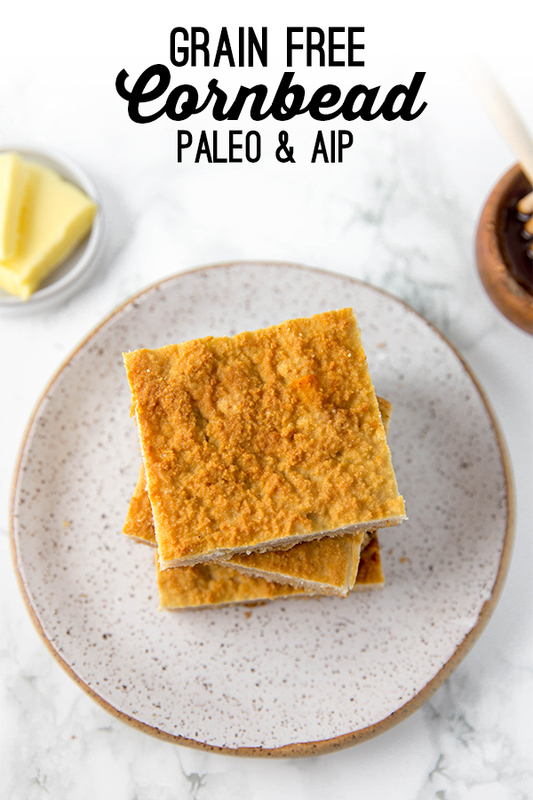 I’ve seen recipes for paleo cornbread before that are made with almond flour… and that sounds delicious. Even though I can tolerate almonds, I wanted to make something that’s nut-free and AIP as well. Almond flour has that gritty texture that’s similar to cornmeal, so I decided to use coconut flour as my base for this bread. I like tigernut flour too, but it wouldn’t yield that light, cornbread color. Luckily, coconut flour made for a great texture in this bread! You can serve this bread by itself as a Thanksgiving bread dish or you hold on to this recipe for later in the winter to eat it with chili, like my Instant Pot Chili or Pumpkin Chili! But honestly, I would just eat this by itself. I don’t need an excuse to make it. It’s that good. As mentioned above, coconut flour yields the best color and texture for this bread. I haven’t tried to make it coconut free, but there are paleo recipes with almond flour instead. You can likely substitute tapioca starch here, but I haven’t tried it myself. Mixing the two of these gives the bread a bit of that buttermilk flavor! The shortening makes for a very cakey, bready texture that crumbles like real bread. I haven’t tried this out with coconut oil, but I doubt the texture would be quite the same. 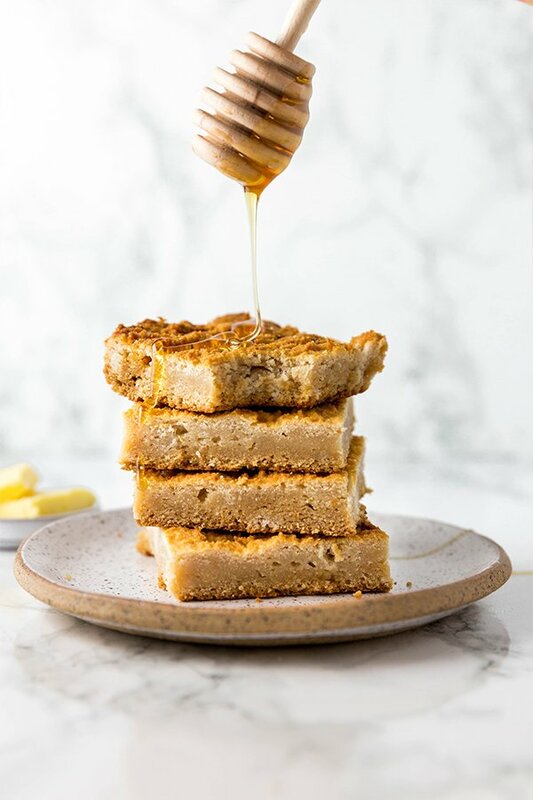 Honey and cornbread are a classic flavor combination. All you need is 2 tbsp to get the flavor, leaving the bread not too heavy on the sugar. You’ll need three gelatin eggs to make this cornbread rise. You cannot sub collagen, but you should be able to use real eggs if you tolerate it. Preheat the oven to 350 F and line an 8×8″ baking pan with parchment paper lightly greased with coconut oil. Combine the coconut flour, arrowroot, baking soda and salt in a large mixing bowl. Stir in the palm shortening and honey until well combined. In a separate bowl, combine the coconut milk and apple cider vinegar. Pour the mixture into the cornbread dough and combine. For the gelatin egg, add the water to a small sauce pot and slowly pour over the gelatin. You don’t want any clumps, so lightly mix if needed. Allow the mixture to rest and harden over 2-3 minutes. Place the pot on the stove and turn in on low heat. Slowly melt the gelatin and remove from heat. Vigorously whisk the gelatin egg until it becomes frothy. Add the gelatin egg to the mixture immediately and mix to combine. Spoon the dough into the baking pan and evenly spread with the back of a spoon or a rubber spatula. Bake in the preheated oven for 20 minutes, or until the top is lightly golden brown. Remove from the oven and carefully transfer the bread by moving the parchment paper onto a cooling rack. Allow the bread to cool completely before slicing. The bread needs to set or it will be gummy if you slice it too early. Slice into 9 pieces and enjoy topped with honey, butter/ghee (if tolerated) or jam! I can’t wait to try this! What sort of honey do you recommend? I cannot tolerate egg yolks. Can this be made with just the whites? Hi Lynn, the recipe is egg free. The gelatin egg is an egg substitute made with gelatin. Can this be made with eggs? If so, how many eggs are equal to the gelatin egg mixture? I’m thinking of trying this in cornbread stuffing for thanksgiving…Do you think it would be good? These were really delicious. Thank you for sharing! ???? I haven’t tried that, but it would likely work… I would just be careful about the source of vinegar. Distilled vinegar can often be made from corn. How do you store the bread? Should it go in the fridge?